We're on a decorating kick here, I guess, and now Leslie is here today with look into her home. Her house is so cute! She has amazing style and her home is always so warm and welcoming. I love decorating and I'm one of those people who is always rearranging furniture and accessories every few months for a new look. I have always loved blues and whites and since my husband is from Maine and that is our favorite vacation spot, our house has always had a "coastal vibe" (even though we are stuck in the dry, Utah desert). Lately though, I've added more vintage elements and pops of green, red and yellow and I finally feel like the look I have is comfortable, and really reflects our family. Kim recently helped me create this picture wall. This wall is such a large white space and I could never figure out what to put there. I found most of these picture frames at D.I. (thrift store) and then decided what colors I wanted to paint them. This took a few weeks of rearranging and trying different combinations. I didn't want too matchy, but also not too busy. I am really happy with how it turned out. (I'd love to paint these walls grey, but that is a big project... some day). I used the 3M Velcro strips on the picture frames for the first time, and they worked great. I wish I had a picture of me on my husband's shoulders trying to hang these. My sister, Kim made this vinyl tree with my husband's and my initials. She did a great job. I put the vinyl right on the wall and hung the frame around it. The sister of my sister-in-law (I'm not making that up) makes some really cute, unique, modern prints, that I love. You can see them here. She made the home can be a heaven on earth print in the first picture, and the silhouettes of my boys below. When we got these family pictures taken in the fall, I didn't want to spend a lot of money hanging them since I knew I would want to change them up after a little while and hang something else there. I found these flat, glass only frames at Hobby Lobby. They are very inexpensive and just the look I was going for. When Kim did the design style post, I took one of the quizzes for fun and this is what it said, "Your style is Folksy Country. You don’t like things to be too matching. You acquire your furniture and accessories over the course of time. You like pattern and solids and can mix them well. You love flea markets and can find a place for just about anything you find or buy. You like animals and probably have a dog or cat or both. You make people feel at home and relaxed. You have lots of knick-knacks. When you entertain you have many friends and family over -- they feel they can pop over at anytime. Your decorating challenge is to simplify and edit your accessories." Yes, Les, I think that totally sounds like you! Aren't her boys so cute! I love those family pictures. And I really need you to make me some cute pillows, she has a great eye for fabrics. Liking patterns and solids, yes, yes, you should have seen her room - solid bright blue on the bottom, bright red chair rail, and red/yellow/blue sprinkles wallpaper on top, with framed M.C. Escher prints and a Mickey Mouse poster. It was a little crazy, but cute! 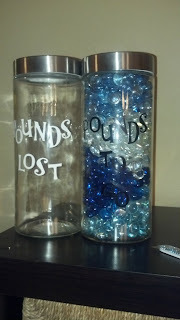 Well, it's been a month now since I started working on my goals, especially my weight-loss goal (see here.) Time to fess up, be accountable, and resolve to do better. So how have I done, well, good and not so good. I'm happy to report that I'm back in the habit of drinking water every day and it's getting easier. Which also means I'm doing pretty good (I slipped a couple times) at limiting my pop intake to only once a week. I've found it's really hard to get all my water in when I nurse a pop all afternoon. Plus if you remember this post here, I have to drink an extra glass of water for every pop I drink. I'm actually not craving it so much either, and I really savor it and enjoy the taste so much more when I do have a pop. I've also started exercising again and it is fun-ish. lol I haven't made it a solid habit again, but I have really tried to incorporate more strength training into every day. Just little bits here and there, but it's something. This is really going to be my focus for the next couple of weeks. I have got to make myself (not really a morning person) get up at 6 and get moving!! So anyway, I've only lost 2 lbs. so far. However, my first week drinking that much water, it must have flushed (ha, ha pun intended) my system and my fingers got skinnier. How lame is it that my fingers and my wrists are the first place I lose weight. But I actually wore my wedding ring the other day (have only wore it sporadically for the last 6 years) and my watch is much looser on my wrist. It's a start. Here﻿ we are to a new month and my resolve, with a slight change in focus, begins again. I've gained some ground, and that's the most important part. I found this great visual reminder on Pinterest. I'm making this and putting it on the shelves next to my desk. 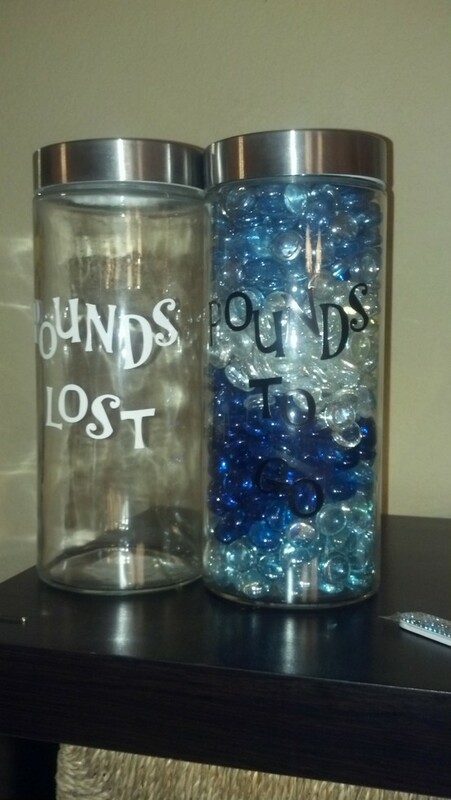 Next month, the "pounds to go" jar will be lower! How are your goals/resolutions coming along? Are you still sticking with them? 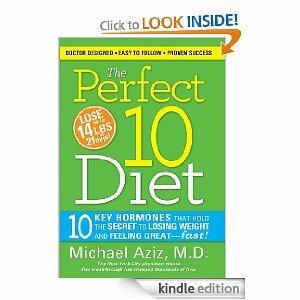 Do you need to reevaluate and maybe make some changes or tweeks to your goal? I don't know about you, but I love looking at other people's homes. I had so much fun the past couple of days peeking at other people's lives through their beautiful (and not so beautiful, actually, lol) homes. That's why we go to home shows, right? I know not everyone I've seen walking through home after home are looking to buy. Okay, so maybe I'm a stalker, I'll admit I enjoy seeing how other people live. Hopefully some of you are the same way. Today I thought I'd give you a glimpse into my home and show you our family room. Oh, and I'm keeping it real here, crooked pictures (I can't believe I didn't notice that before), messy desk, and everything. :) And it's kind of hard to take pictures of this room. While it's nice and bright with windows on 3 of 4 walls, every direction is shooting towards a window, so bare with me. This was a couple years ago at our Superbowl party with some friends, Bill's brother and aunt and uncle. The redo was brought about because the couch had seen better days and Bill had FINALLY warmed up to the idea of color on the walls. So the whole family went shopping for a new couch. Imagine trying to make 8 people happy. Well, I got out voted when they all fell in love with this couch. While I liked it, I didn't love it. I didn't really want a sectional again, thought the fabric was a little weird (it's kind of like terry cloth), and really wanted something more tailored. But it had room for all 8 of us, Bill could definitely see himself falling asleep there, and it was a "non-snuggling" couch (Bill's term) - important now that Cheyenne can date. I do like it more now. :) It is very soft and great to relax in. As I said, Bill liked white walls. When we built our house 10 years ago, he even wanted me to take a picture of the nice, white, bare walls before I hung anything up so he could always remember it. He warmed up a little when he finally gave in and we painted our bedroom a beige color. So to my utter surprise, he picked out this dark brown for the walls. This was a very bold step. When we finished painting, I was almost sick! The walls looked purplish. The next morning it wasn't much better. I was ready to redo the whole thing, but Bill convinced me to wait a few more days. I don't know if it was letting the paint cure more, getting used to the color, or having the couch delivered and more brown in the room, but it looked a whole lot better. It's like the color of chocolate milk. Really! Kind of makes me hungry sometimes. This is my favorite part of the room, my photo gallery. I hadn't heard the term "photo gallery" when I did it and didn't know if I could really just have this across this great big wall. I'm no decorator and have serious doubts when it comes to my decorating ability. lol Plus, you can see a little bit in the before picture, I had a whole quilt hanging here plus all the kids' pictures - just a whole lot more stuff. I wasn't so sure it looked "right" to be so plain, but I love it now. Other end of the room. Really dislike the desk, and the reason we have to have short curtains, but Bill's not too excited about a new desk. This is sort of his desk so it has to meet all his requirements. So still trying to convince him we need a new one. I love this little desk/table, but it is also in need of a makeover. I think I've decided what I'm going to do, now just waiting for the weather to warm up a little to get started. And finally we've made it around the room. That's the couch in the lower right corner, and the opening to the kitchen is just to the left. You can also see the front door in the upper right corner, we have a very open floor plan, it's nice. I love this spot, too. I told the whole story about this spot here. So that's it, a little tour around our family room. If you read this post here when I said my family would be laughing at how spot-on the description of "Classic Traditional" was for me, you can now see it, too. Beige - replacing the navy and burgundy, a little boring, plenty of family pictures, yup, that's me. So help me break out of my rut a little. While I really enjoy my room, the end with the desk has never seemed right to me, too empty, but I don't know what else to do with it. Do I have too many tables in here? I would love to hear any suggestions or what you would do different in a room like this. It's always nice to get a fresh perspective on things. "You like to surround yourself with things that make you comfortable, so Country style is the way to go. This look connects with nature and days gone by while remaining fresh and original. An easy place to start your Country decor is with a blue-and-white color scheme and weather-worn wooden tables or benches. Accessorize with collections of anything you love. Antique furnishings—often creatively repurposed for today's lifestyle—are casual and rustic." This is some what true, although I don't really like EVERYTHING rustic or antique, not a huge fan of blue-and-white color scheme, and I strongly dislike ruffles and flowery stuff - so not me! "You’re about comfort and warmth, favoring warm, traditional rooms made for relaxing with family and friends. Your ideal decor draws on English and early-American furniture designs, as well as laid-back country, cottage, and farmhouse styles. Weathered, low-maintenance furnishings are easy, inviting, and built for daily life. Think golden retrievers, fuzzy slippers, and just about any movie by Nancy Meyers. 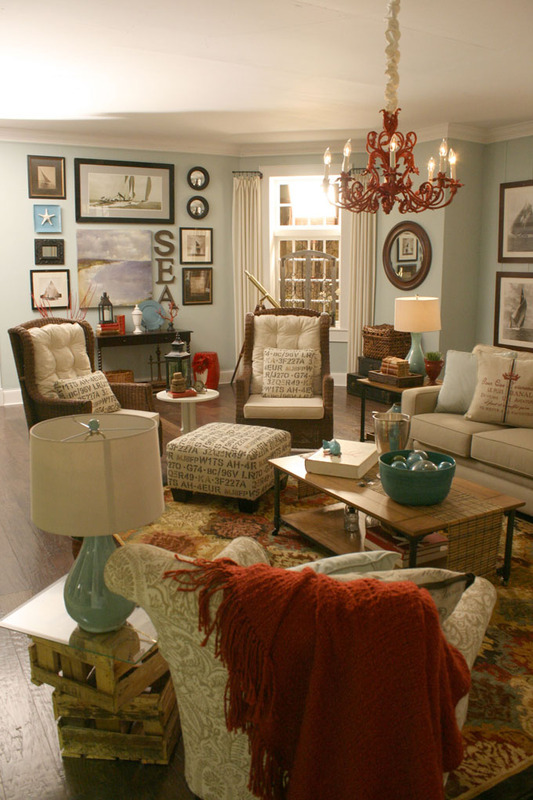 To see more about Cozy Casual style, including a sample room, click here." I like this description, it is pretty good. Farmhouse style, yes, my house is a farmhouse style; golden retriever, I'd love one; fuzzy slippers, yes, I'm wearing mine right now. I had to look up who Nancy Meyers is and while I do like most of her movies, they're not my favorites. I love this room, except the flowery chairs. I'd like them in red. And that couch, the one in the center of the picture, love it. In fact, I have a couch very similar to that. This quiz also gave some features of each design style. Cozy casual likes rolled arm couches with ball feet or skirts - that's totally what I'm always drawn to. "Your style is Classic Traditional. You like things matching and well placed. You prefer classic colors such as navy, burgundy, forest green, and beige. You buy furniture that stands the test of time. You don’t like trendy fads nor clutter. You keep a clean house. There are only a few knick-knacks but plenty of family photos. Traditions and family are important to you. When you entertain you invite close friends and family. You don’t like new things and are hesitant to try new colors or furniture placements. You grew up in a very traditionally decorated home and that is what you are most comfortable with. 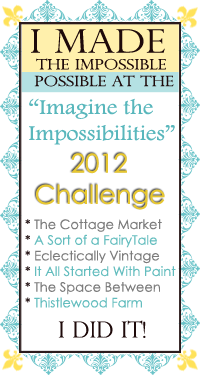 Your decorating challenge is for you home to not be too predictable or boring." So what do you do when you want to spruce things up a little. I start dreaming. Pinterest is great, I have my "For the Home" board there where I collect all my inspirations usually from other places on the web. However, It's amazing what others have posted as well. 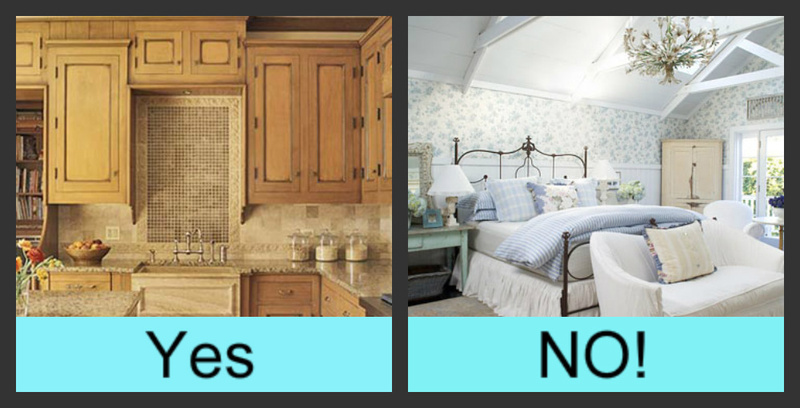 Search for whatever you're looking to update, kitchen, bathroom, etc. and you'll find all kinds of things. All three of the above posted sites had great home style tips and articles, also, but my favorite new place to visit is Houzz.com. Wow, talk about an amazing collection of home ideas!! They have everything from exteriors to interiors, pools to porches, even closets to wine cellars. lol You can even save everything you like to your own "idea book." It's fun! So what's your design style? Does your house reflect who you are, your personality? If you take any of these quizzes, I'd love to hear what your design style is and if you agree with it. P.S. 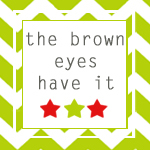 My sister and frequent guest poster, Leslie, took the quiz and shared her fabulous style here. I'm excited to welcome our guest-blogger today, Christina Johnson. I was thrilled when she contacted me and asked if she could do a guest post here. Sure!! So let's get to know her a little. "Christina Johnson works remotely for Elliman Prudential in the NYC Apartments and Rentals market. She is using her journalism major to combine what she loves most, writing and her career. Her specialties include home decor design and DIY home improvement projects." She sent me this wonderful article on family rooms. I love my family room! Next to the kitchen it's probably the room my family spends the most time in. 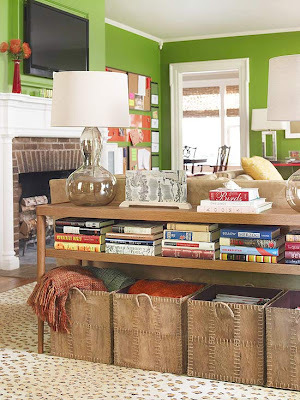 Read on to learn some great tips on making the most of your family room. A lot of homeowners tend to overlook the design opportunities available for the family room. Because it isn't a formal room, it often becomes a catch-all collection of odd furniture, toys, crafts and other accessories. However, there are several very affordable and unique interior design techniques that can be used that will make it even more inviting for the whole family. When you make plans to enhance or improve the decor of a room, it is important to first consider the focus or goal of that room. You will want to determine what you will be using the room for and think about the mood you want to set. In most cases, the family room is the most relaxed and comfortable room in the home. Because of this, it is where many families spend most of their time together. 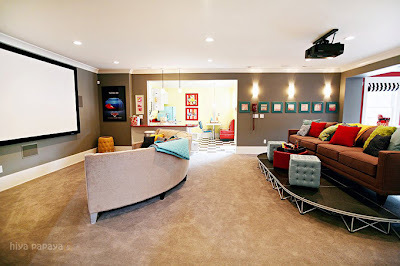 Some families work to create a whole home theater experience, while others focus more on games. Some families like to do activities or crafts together, while others might want to establish a quiet place to gather, read or just spend some quiet time together. You don't have to spend a lot of money to create the family room you've always wanted. One of the easiest ways to make big change on a little budget is to start with a splash of color. A bucket or two of paint and supplies will cost less than $50, but can make a big difference to any room. Think about the colors that will best express the focus of your family room, such as neutral or pastel colors for a relaxing environment or bold colors for an exciting activity-focused room. Consider using two different colors to add focus or fun to one or more walls. You can paint or use color stain on wood paneling or add a splash of color to furniture, shelving and cabinets. Don't be afraid to think "outside the box" and try something new. If movies are your thing, consider adding a nostalgic popcorn popper, add some light-blocking curtains and arrange your furniture to create optimal viewing opportunities. 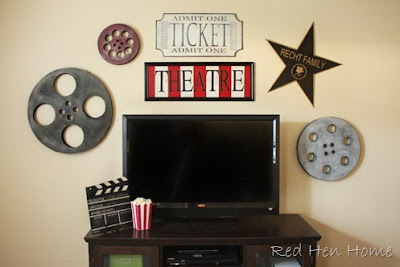 Many decorating stores now carry old-fashioned looking marquee signs, metal art that features movie reels and film or movie posters of your favorite films. If your family activity-oriented, consider adding a table and chairs for board games or crafts, a gaming area for video games and some nice shelves to keep it all neat and organized. There are a lot of great store-bought options available, but you can also find new uses for old items that will keep things organized at a fraction of the cost. A nice area rug, throw pillows, afghan or new lamp shade in coordinating colors can help bring it all together. Whether your tastes are contemporary or tend to be a bit more conservative, make sure to choose new items to add that will enhance the message or emotion you are trying to express. Curtains, shades, blinds and other unique window treatments can also help to tie your room's decor together. 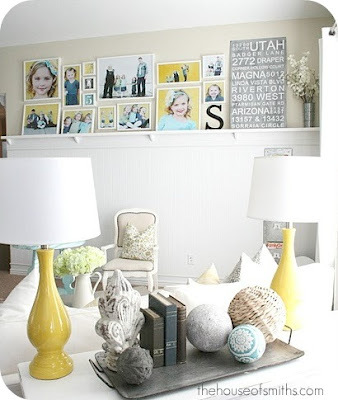 Purchase artwork that matches your theme or buy a blank canvas, grab some paints and encourage your kids to create a unique piece of artwork to hang on your walls. Use family photos to create a whole wall display. You can use black-and-white photos or color, add matting and choose from brightly painted, simple black or traditional metal frames. It doesn't matter how much money you have to spend or how much you know about interior design, it is easy to create a cozy family room in no time. A good plan, a little research and some old-fashioned elbow grease will help you design a useful, comfortable room that the whole family will love. Thank you, Christina!! Great article and I had so much fun drooling over, um, admiring tons of beautiful, fun family rooms to find these pictures. Because Christina doesn't have her own blog, you can leave her lots of good comments here. Come back on Wednesday for some more designing fun -What's your design style? Mix all ingredients and store in a spray bottle. Spray on anything with grease or food spots and wash as usual. This is super cheap and will get out about anything. It'll get out most food grease spots even after being washed and dried - you know, when the kids don't tell you or the kids themselves are doing wash and just shove everything in. It's also really good at removing ring-around-the-collar. I also found this recipe for laundry soap - it's all over the internet. However, I've never tried it myself. I already ruined a washing machine because I used too much soap and I'm not sure how "soapy" this is. Plus, when we bought our same washing machine 4 years later, the sales lady told us to only use 1 tbsp. of soap at the most per load. This has worked great for us, getting all our clothes clean. I bought a HUGE box (I can't remember how many pounds) of laundry soap when our triplets were born and almost 7 years later I still haven't finished it yet, getting very close though. Cut sponge into 4 sections. Mix Downy and water. Store sponge in mixture; drain one sponge for each load of laundry. Put sponge in dryer with clothes. When load is done put sponge back into the mixture to use again. If you don't like using fabric softener because it leaves a coating on your clothes i.e. your skin; because of allergies/sensitivities; or because like all of my husband's wrinkle-free dress pants say not to use fabric softener; I use vinegar. I add 1/2 to 1 c. to the rinse cycle, just pour it in the fabric softener dispenser. You can smell the vinegar when the clothes are wet, but when they're dry they have no smell. Believe me, my husband with his "super-smeller" can't even smell the vinegar after the clothes are dry. I use dryer balls, like these, to cut down on the static electricity in the dryer. Before washing a mustard, ketchup, spaghetti, or barbecue stain, dab with white distilled vinegar. Get cleaner laundry! Add about 1/4 cup white distilled vinegar to the last rinse. The acid in white distilled vinegar is too mild to harm fabrics, yet strong enough to dissolve the alkalies in soaps and detergents. Besides removing soap, white distilled vinegar prevents yellowing, acts as a fabric softener and static cling reducer, and attacks mold and mildew. It helps keep colors from running, and helps keep hair (pet or human) and lint from clinging to clothes. Do you have any more great tips for laundry? Please share them in the comments. We can all benefit from being thrifty and a little more "green" health wise in the laundry room. They make me smile. They're pretty goofy. I sure love them all! Anyhoo, the real reason for the post today, my sister, Leslie﻿, and I both got iPads for Christmas. So we want to know your favorite apps. Leslie wondered if anyone had any recommendations for good educational (kids) apps. I just want to know anything fun, helpful, whatever, that you use. I'm pretty much a novice to all apps. I don't even have a smart phone! Gasp!! I know, heck, I barely started texting a few months ago. So any recommendations would be awesome. What apps can you not live without? Which ones do you use daily? Which ones do your kids play/use when they steal your iPad? Leave a comment and let us know your favorites. Do you have any "wild things" in your home? My sister, Leslie, is back today with another great birthday party idea. We did this party when my youngest turned 2. He has always been a bit of a "wild thing" so this was a fitting theme, plus our family loves this book. The decorations were really fun to make. The cupcake idea came from here. To make these personalized illustrations, I found images from the book online and printed them (you could also scan pages from the book). Then, I copy and pasted pictures of the birthday boy into Microsoft Word. I sized them down to fit the illustrations, and then printed and cut out his picture. Then, I glued them on to the illustration print outs. I still laugh when I see these. We still have some hanging in his room. For the party guests, I made these fancy crowns (with help from the B.K. employee who said we could have six : ), using the same method listed above. The kids loved to see their pictures in place of "Max." They also received their own copy of the book. The wild guests, looking quite docile at the moment. 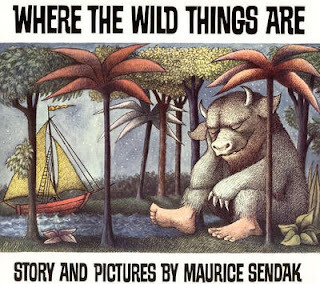 After my husband read the book to the kids, we gave them sixty seconds to "Let the wild rumpus start." They yelled, screamed, and ran around like crazy...actually, now that I think of it, it seems like it was only my boys running around like crazy, and their cousins staring at them in panic. Thank goodness it was only sixty seconds! A few days after the party, when the fun of tearing through the house in their "Max" crowns wore off, I cut out the pictures from the crowns and glued them inside our copy of Where the Wild Things Are, so I can always remember my three wild things at this age.